This class describes a bounding box. Definition at line 244 of file CLBase.h. Definition at line 254 of file CLBase.h. Definition at line 257 of file CLBase.h. Definition at line 55 of file CLBase.cpp. Definition at line 269 of file CLBase.h. References CLDimensions::getHeight(), CLDimensions::getWidth(), CLPoint::getX(), CLPoint::getY(), mDimensions, and mPosition. Referenced by CCopasiSpringLayout::borderProjection(), and CCopasiSpringLayout::finalizeState(). Definition at line 266 of file CLBase.h. Referenced by CLabel::adaptToHeight(), addToPath(), adjustPosition(), CQGLLayoutPainter::calculateAndAssignBounds(), CLayout::calculateAndAssignBounds(), CLayout::calculateBoundingBox(), CQGLNetworkPainter::checkCurve(), CLLayoutRenderer::convert_to_absolute(), CCopasiSpringLayout::createLayout(), CLLayoutRenderer::draw_datapoints(), CLLayoutRenderer::draw_ellipse(), CLLayoutRenderer::draw_group(), CLLayoutRenderer::draw_image(), CLLayoutRenderer::draw_layout(), CLLayoutRenderer::draw_rectangle(), CLLayoutRenderer::draw_selection_box(), CLLayoutRenderer::draw_text(), fillItemFromEllipse(), fillItemFromImage(), fillItemFromRectangle(), fillItemFromText(), CLGraphicalObject::getDimensions(), getFont(), CLGraphicalObject::getHeight(), getLinearGradient(), CLLayoutRenderer::getObjectsAt(), CLLayoutRenderer::getObjectsInBoundingBox(), getPath(), CQGLNetworkPainter::getPointNearCircle(), CQGLNetworkPainter::getPointOnCircle(), CQGLNetworkPainter::getPointOnRectangle(), getRadialGradient(), CLGraphicalObject::getWidth(), CLLayoutRenderer::map_arrow_head(), moveToPoint(), compareGraphicalObjectsBySize::operator()(), CCopasiXML::saveBoundingBox(), CLGraphicalObject::setHeight(), CLGraphicalObject::setWidth(), CLLineEnding::toSBML(), and CLLayoutRenderer::update_textures_and_colors(). Definition at line 270 of file CLBase.h. Definition at line 265 of file CLBase.h. Referenced by addToPath(), adjustPosition(), CQGLLayoutPainter::calculateAndAssignBounds(), CLayout::calculateAndAssignBounds(), CLayout::calculateBoundingBox(), CQGLNetworkPainter::checkCurve(), CLLayoutRenderer::convert_to_absolute(), CQLabelGraphicsItem::CQLabelGraphicsItem(), CLLayoutRenderer::draw_datapoints(), CLLayoutRenderer::draw_ellipse(), CLLayoutRenderer::draw_group(), CLLayoutRenderer::draw_layout(), CLLayoutRenderer::draw_selection_box(), CLLayoutRenderer::draw_text(), fillItemFromEllipse(), fillItemFromImage(), fillItemFromRectangle(), fillItemFromText(), getLinearGradient(), CLLayoutRenderer::getObjectsAt(), CLLayoutRenderer::getObjectsInBoundingBox(), getPath(), CQGLNetworkPainter::getPointNearCircle(), CQGLNetworkPainter::getPointOnCircle(), CQGLNetworkPainter::getPointOnRectangle(), CLGraphicalObject::getPosition(), getRadialGradient(), CLGraphicalObject::getX(), CLGraphicalObject::getY(), CLLayoutRenderer::move_graphical_object(), moveToPoint(), CCopasiXML::saveBoundingBox(), CLabel::scalePosition(), CLGraphicalObject::setX(), CLGraphicalObject::setY(), and CLLineEnding::toSBML(). Definition at line 268 of file CLBase.h. Definition at line 60 of file CLBase.cpp. Definition at line 275 of file CLBase.h. Definition at line 285 of file CLBase.h. 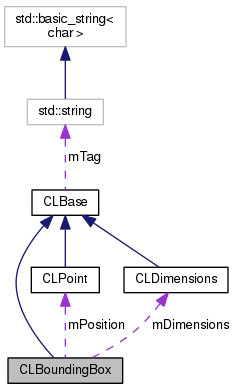 References mDimensions, mPosition, CLPoint::scale(), and CLDimensions::scale(). Definition at line 273 of file CLBase.h. Referenced by CLabel::adaptToHeight(), CLGraphicalObject::setDimensions(), and CCopasiXMLParser::BoundingBoxElement::start(). Definition at line 272 of file CLBase.h. Referenced by CLLayoutRenderer::draw_layout(), CLGraphicalObject::setPosition(), and CCopasiXMLParser::BoundingBoxElement::start(). Definition at line 250 of file CLBase.h. Referenced by getCenter(), getDimensions(), getSBMLBoundingBox(), operator<<(), scale(), and setDimensions(). Definition at line 248 of file CLBase.h. Referenced by getCenter(), getPosition(), getSBMLBoundingBox(), moveBy(), operator<<(), scale(), and setPosition().